Happy Friday Everyone! 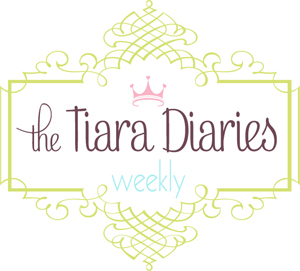 It has been a while since I have offered a freebie so I hope that you enjoy this one. 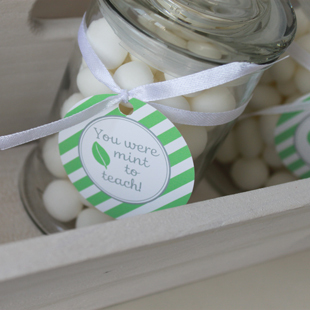 This coming Tuesday, May 8th is Teacher Appreciation Day, and in some areas Teacher Appreciation Week from May 7th to 11th, so I whipped up a little something to help you pull together a small gift for a special teacher that you know. 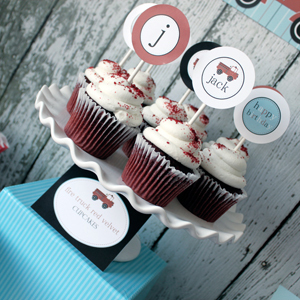 I just love this set of printable party circles that I designed. 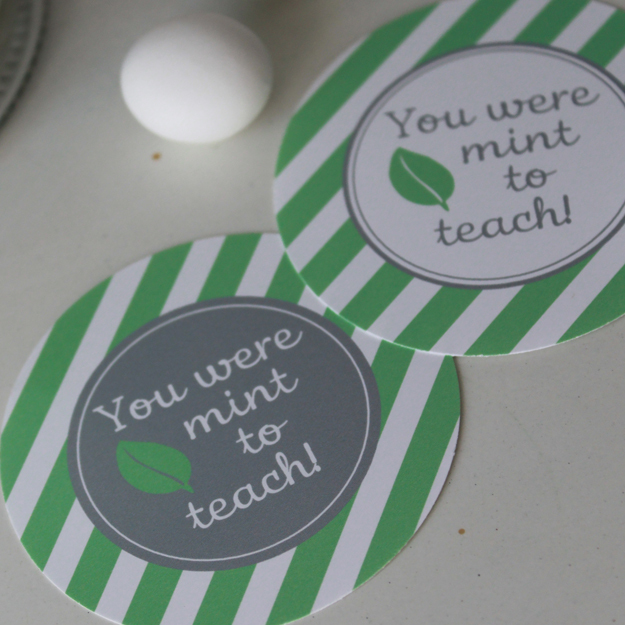 The colors are mint and soft grey with a mint leaf graphic and the cutest little saying “You were mint to teach!” So inspiring and a sweet way to say thank you. 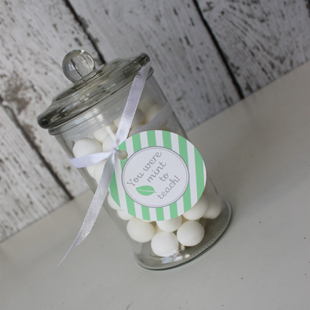 Pair these printable party circles with a little jar of mint candies and you have yourself an adorable gift. 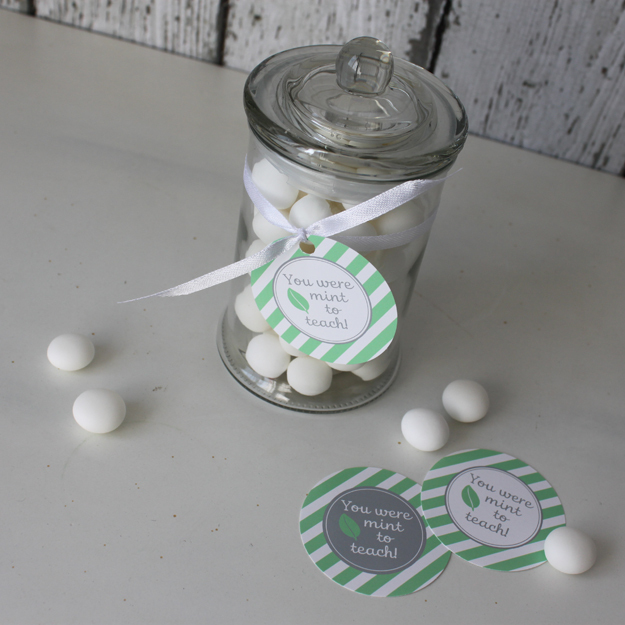 This set of freebie printable party circles comes with two designs, one with a solid white circle and one with a solid grey circle, as shown below. Once you download your set you can print as many as you need. 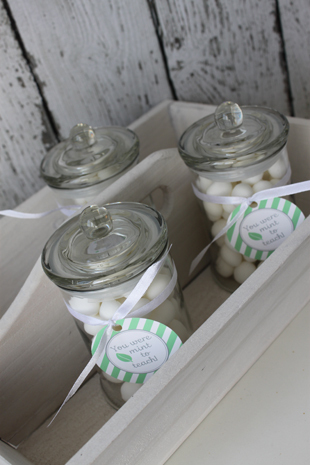 You can make an entire basket of small minted gifts if you like. 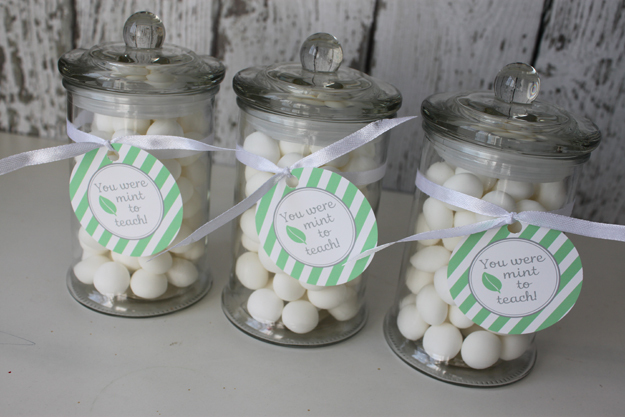 Scotch mints in a jar or a batch of decadent chocolate cupcakes with mint frosting and these circles as the toppers. 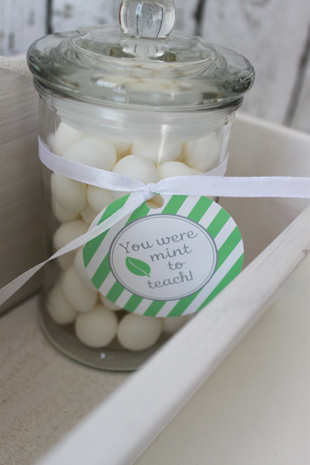 Enjoy and thank you to all those wonderful teachers out there! How do you get the download? When click get your free here, a new internet page opens up but says page cannot be displayed. I am sorry that you are having trouble. I just tried on this end and things seem to be working fine but try this link and then click on the FLASH SITE to download your freebies. If you are still having trouble, let me know and I will get a hold of my IT department to see if they can help. Talk to you soon! I’m still not sure what to do. Once I”m on the flash site it’s a big gray box in the middle and a place for comments at the bottom. OK, it was some security deal that wasn’t showing all the content. I got them now! thank you! Oh I am so happy! Enjoy Karen! Hi Nicola! 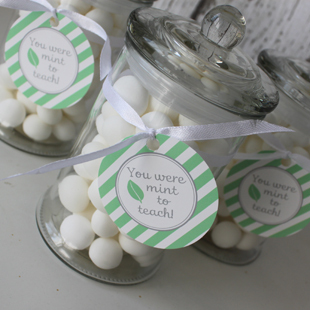 I love the idea and want to do mints for teacher appreciation week:). However I am having trouble accessing your free printable. Any tips? 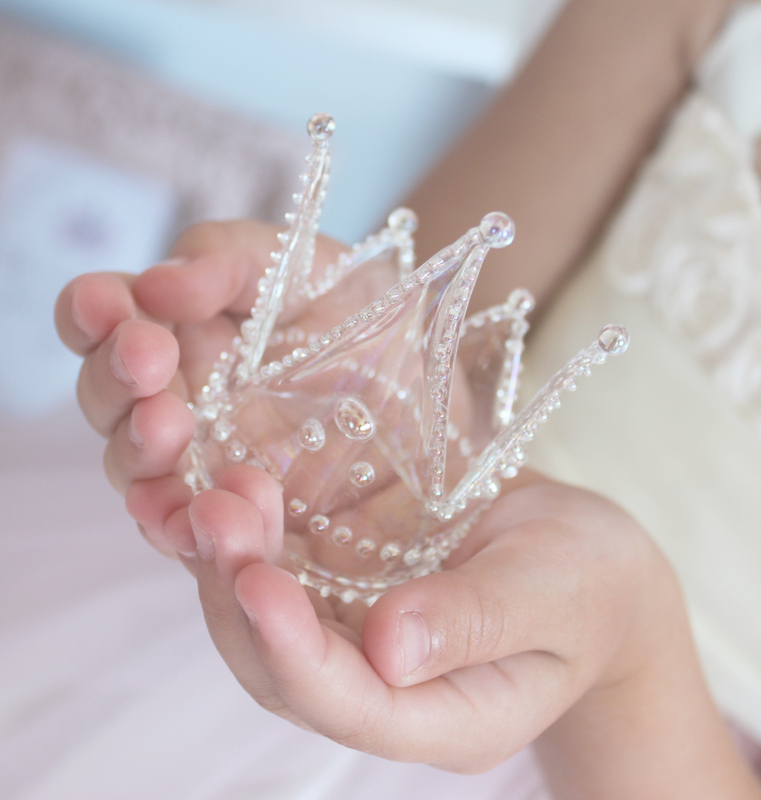 Thank you again so much they are so adorable! 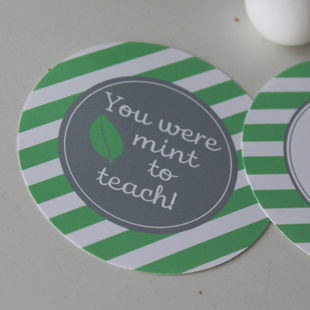 Thank you so much and I am so happy that you like the printables! Could you tell me at what point you are having trouble? That way I can better understand where the problem might be. Talk to you soon!